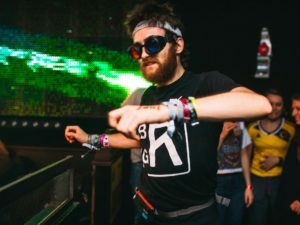 Our pal Bradley Gunn is no stranger to marathon rave sessions, with the average weekend seeing him ping pong across the country to attend more raves than you do in a month. But even his seasoned rave feet have got to be aching today as this weekend saw him dance for 24 hours straight in aid of charity. Bradley kicked off the rave-a-thon early on Saturday morning and danced through the day and night into Sunday, with only a few short breaks to catch his breath. The endurance feat took place at Taboo Nightclub in Bristol and saw Bradley’s friend, Craig Brown, DJ for the duration. This will take Craig into the small group of DJs who have managed to pull off such a feat, the most famous of which is probably DJ EZ, who live-streamed his attempt back in 2016. Bradley and Craig were taking on the gruelling task in order to raise money for mental health charity, MIND. The total amount of money raised has yet to be revealed, but even before the first track was played they’d raised over £1,000.